The rise in natural gas production in the U.S., along with the volume of proved reserves available in the future because of new technologies, could fundamentally change the energy landscape in the U.S. in a way that the significant and beneficial rise in U.S. oil production can not. Both trends are good news for the country and further efforts toward U.S. energy independence, but the lower prices and increased stability in supply of natural gas also have the potential to alter the energy fuel mix in this country. The use of natural gas has yet to make significant inroads in the transportation sector but it is hard to imagine how a fuel supply that (unlike gasoline) is, or could be, available directly at a majority of U.S. households at reasonable prices, will not eventually fuel a much higher percentage of vehicles in this country. In the electric power industry, the transition to natural gas is already occurring, in part because of the lower and more stable price environment for natural gas, but also because of the environmental advantages of natural gas. 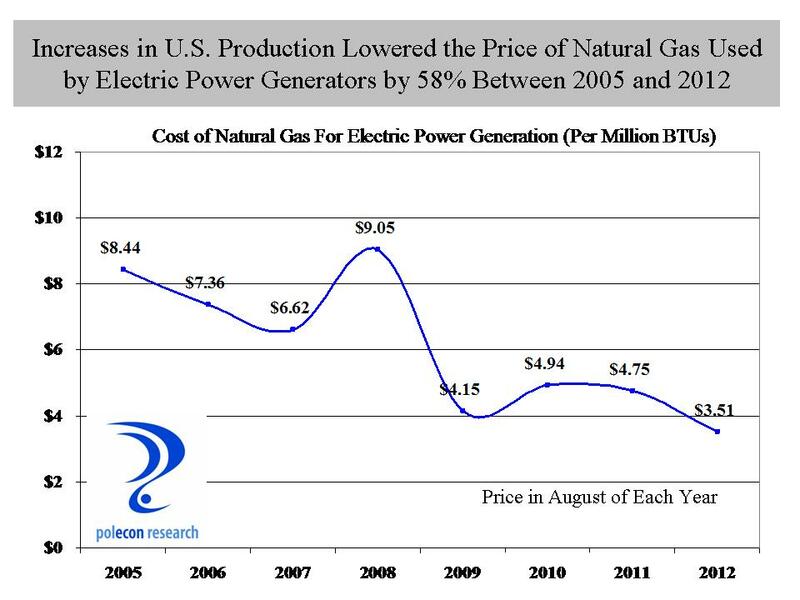 The chart above shows that the price of natural gas used by the electric power industry for generation has fallen by almost 60 percent since 2005. Although that trend will not continue, production and proved reserves in the U.S. have created a much more predictable and stable price environment for natural gas as evidenced by forecasts by the U.S. Energy Information Agency and by commodity futures markets. The electric power industry is already changing to reflect the new realities of natural gas markets. 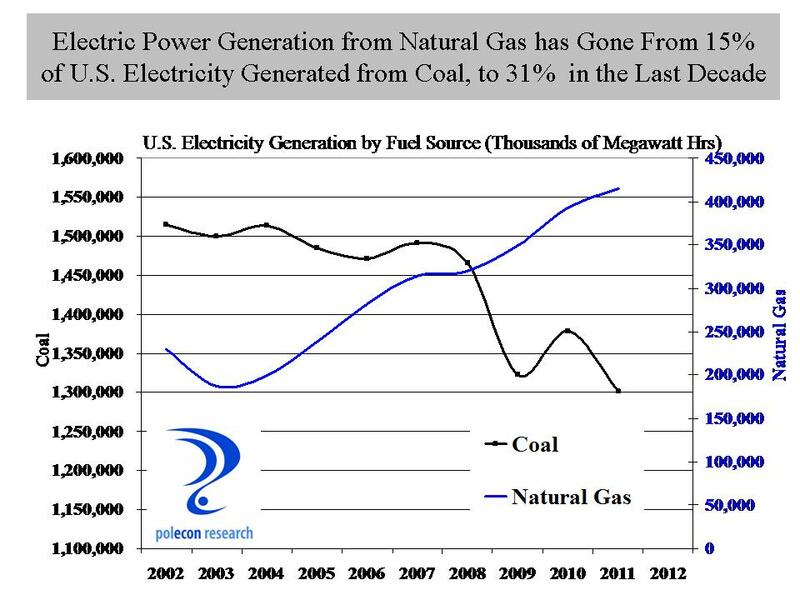 As the chart below shows, in just the past decade electricity generated using natural gas has gone from 15 percent of the electricity generated by coal fired power plants to 31 percent. That trend is continuing. Just one company (First Energy), recently announced the closing of six coal fired power plants in Ohio, Michigan, Pennsylvania, and Maryland, noting that the costs of environmental compliance upgrades made the plants not economically viable to continue to operate. This entry was posted on November 19, 2012 at 9:22 am and is filed under Electricity Generation, Energy, Natural Gas, Uncategorized. You can subscribe via RSS 2.0 feed to this post's comments.